While the West Coast has been basking (and burning) in the sun, Southern Ontario has been having a very cool, wet Spring and early Summer. Trenton, the closest official weather station to our farm has recorded over 150 mms of rain in June while normally moist Abbotsford has recorded only about 10 mms in the month. We usually say “June gloom” here but instead we have had one of the longest stretch of days with highs above 30 degrees ever recorded. 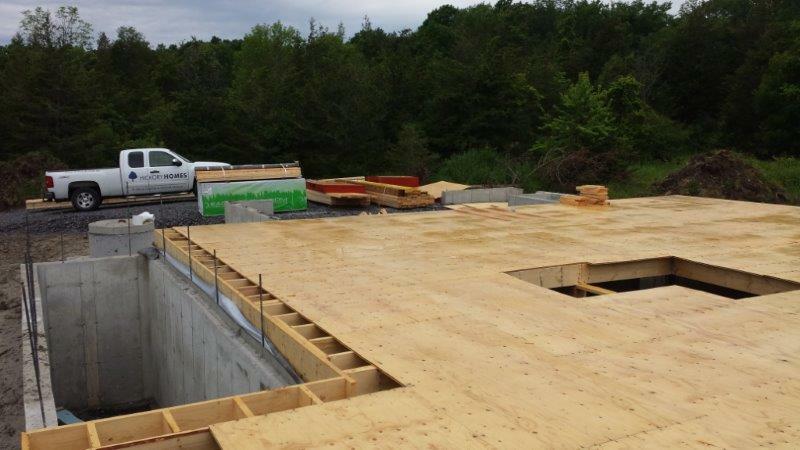 It has been so wet in Prince Edward County that our builders have had difficulty accessing one of their building sites with heavy trucks so progress has stalled on that site. At our site, the drainage is better (all the limestone near the surface helps) and they have been making intermittent progress. Hopefully they will make even more progress this week and the walls will get framed. Stay tuned for more photos! In the meantime, BC people, feast your eyes on the cool, moist conditions. I had better get outside with the hoses and try and keep some of the plants alive.